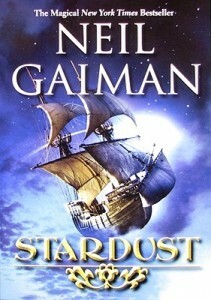 It was exciting to see Neil Gaiman live at the City Recital Hall in Sydney on the weekend. It was a satellite event of the Sydney Writers’ Festival (surely one of the world’s best writers’ festivals). As Jemma Birrell, Artistic Director, mentioned in her introduction, Neil has over 2 million twitter followers so no wonder it was packed, with standing-only tickets sold as well. Neil obviously enjoys reading from his works and speaking to his Sydney fans. He also sang with FourPlay, an Australian electric string quartet. They started with the Dr Who theme music; appropriate because Neil wrote two episodes of this cult series. He read from Trigger Warning: Short Fictions and Disturbances, an anthology that will be published 3rd February. Neil reminisced about a presentation in the past where he could choose whoever else he wanted with him on the panel. His wish-list included his wife, Amanda Palmer – extraordinary singer-performer formerly from The Dresden Dolls (who he couldn’t stop mentioning during the evening) – and Ben Folds (one of my favourite singer/songwriter/pianists – and who Kate Miller-Heidke – composer of John Marsden and Shaun Tan’s The Rabbits opera) has toured with. The panel planned to get together beforehand over a meal but Ben Folds suggested writing 8 songs in 8 hours instead. Neil explained, ‘If you don’t know Ben Folds, that’s all you need to know’. They ended up writing 6 songs in 14 hours and Neil sang us his song about Joan of Arc. 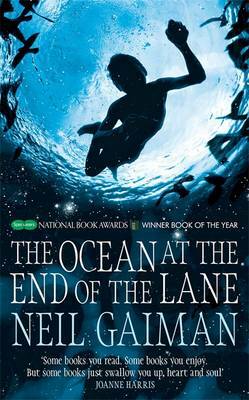 Neil is well known for Sandman, The Ocean at the End of the Lane and The Graveyard Book, which he revealed was based on his experience of living in a tall building with his young son who he would take to the nearby graveyard to play. His son would ride around the graves looking completely at home. I’ve been a fan of Neil’s graphic novels for YA and children for quite awhile. I’m always talking about Wolves in the Walls, illustrated by Neil’s extraordinary collaborator, Dave McKean. 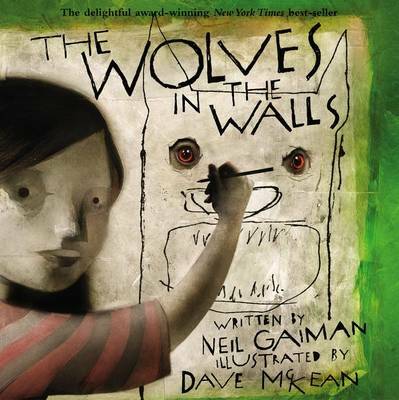 This is a fascinating picture book about Lucy, who hears wolves in the wall but her parents don’t believe her. The frames around the panels hint at what’s hiding. Some of Neil’s other books illustrated by Dave McKean are dark, intricate, imaginative works of art: Tragical Comedy or Comical Tragedy of Mr Punch, Signal to Noise and Mirrormask. I treasure my copies. Many people will know about Coraline, the girl who finds new, sinister parents in another part of her house. 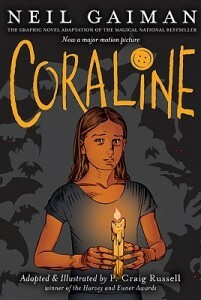 Coraline has appeared as a graphic novel, illustrated by P. Craig Russell, a novel, and a movie. 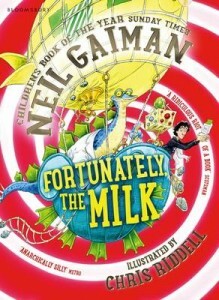 Neil wrote Odd and the Frost Giants and Fortunately, the Milk, illustrated by Chris Riddell for children, and his picture books for young children are Chu’s Day and Chu’s First Day at School, illustrated by Adam Rex. I haven’t yet seen the recent Hansel & Gretel and The Sleeper and the Spindle, illustrated by Chris Riddell. Hopefully they’re up to standard. One of my all-time favourite movies is Stardust, based on Neil’s graphic novel. He has many other works published as well. Thanks to the Sydney Writers’ Festival for this amazing event.